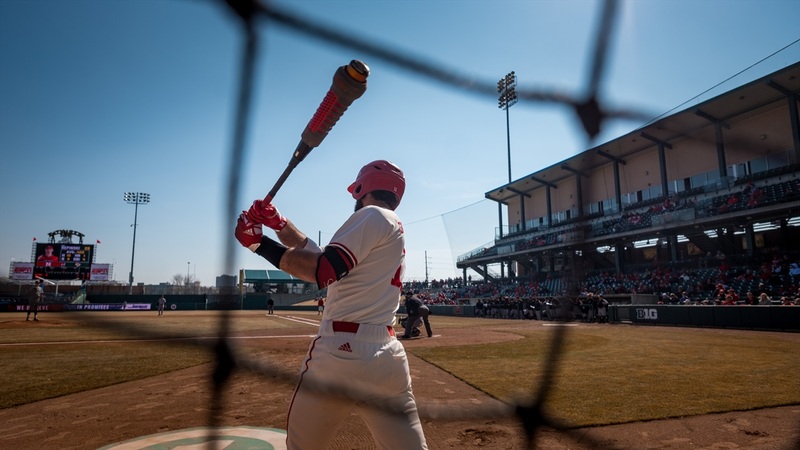 Once again the Nebraska baseball team showed what it could be, or at least what folks thought it could be, by splitting a double-header with Iowa at Hawks Field on Friday. Iowa won the first game 7-1, but the Cornhuskers showed a season-long resilience, coming back to take the second game 10-4, powered by a pair of Angelo Altavilla home runs, on a day when a strong wind blew out to right field. They were his first of the season. In fact, the senior infielder was batting only .211 with two extra-base hits – a double and a triple – going into the game. Because he was coming off a hamstring injury, he didn’t play in the first game until the seventh inning. He fouled out to third in his only at-bat. He struck out in his first at-bat of the second game but in his next at-bat, in the third inning, he hit a two-run home run just one batter after Jesse Wilkening’s two-run home run had given the Cornhuskers’ a 2-1 lead. Altavilla added a solo home run in the fifth. “I don’t know how I did that. I was just itching to get out there,” Altavilla said. In high school, he once hit three home runs in a game, two grand slams and a three-run shot. The third-inning was a veritable scoring explosion for Nebraska; Luke Roskam had a double to reach base before Altavilla. Roskam drove in a run with another double in the seventh. Three runs, two of them scoring on a Gunner Hellstrom double, followed in the seventh to eliminate suspense in the second Friday-the-13thgame, which saw a dramatic drop in temperature. Nebraska’s first batter in the first game, Zac Repinski, reached on an error, and scored on back-to-back singles by Scott Schreiber and Wilkening. Schreiber doubled in his first at-bat of the second game to extend a hitting streak to 12 games. He’s had at least two hits in nine of those 12 games. Nebraska wouldn’t score again until the four-run third inning of the second game. It left 10 runners on base and hit into four double plays in the first game. Second-game starter Matt Waldron went seven innings, allowing only three hits – including home runs by Tyler Cropley and Robert Neustrom – walking one and striking out four. The temperature at game time was 75. By game’s end, it had dropped some 20 degrees. Luis Alvarado, who started the opener, allowed only three hits in 3.1 innings. But he walked three, hit two batters and threw two wild pitches among his 60 pitches. Picked to finish second in the Big Ten in the preseason coaches’ poll, Nebraska is 16-17 overall and 3-7 in the Big Ten. Right now that means the Cornhuskers will have to be consistent overall, not just resilient game-to-game, if they’re to qualify for one of eight spots in the Big Ten Tournament. The third game of the Iowa series will be played on Sunday, weather permitting. Then Nebraska is scheduled for non-conference games against Kansas State and Omaha at Hawks Field on Tuesday and Wednesday before resuming Big Ten play with a three-game series at Rutgers.